Moshier potters have teamed up with Discover Burien and Burien Parks and Recreation to host Empty Bowls 2018. Empty Bowls events can be found around the country raising money to combat hunger in our communities. 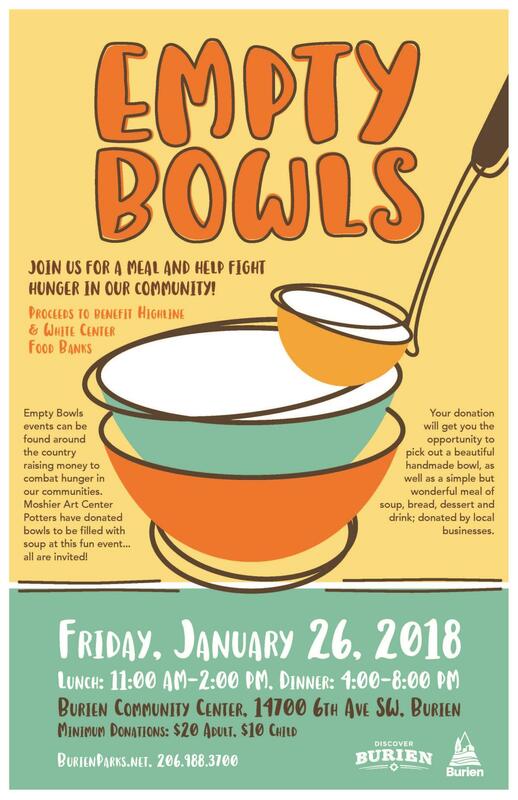 Potters have donated bowls to be filled with soup at this fun event…all are invited! Your donation will get you the opportunity to pick out a beautiful handmade bowl, as well as a simple but wonderful meal of soup, bread, drink and dessert donated by area businesses. Proceeds will go to the Highline Food Bank and White Center Food Bank. We will also host a raffle/auction of beautiful handmade serving bowls and platters, and wine! Wine sampling from 4-5pm, and wine for purchase from 4-8pm.